FISS 2016, our 11th Summer School, takes place in Joshua Tree, California. Focusing is a way of tapping into your vast emotional intelligence through the messages of your body. Focusing gives you direct access to your own inner compass, where you know the right direction for your life. At the Focusing Institute Summer School (FISS), you'll study each morning with an internationally respected Focusing teacher, and enjoy a variety of classes each afternoon. 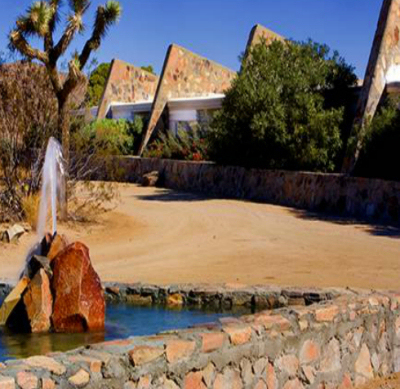 Join us at the beautiful Joshua Tree Retreat Center (designed by Frank Lloyd Wright and his son Lloyd) in the California hi-desert which means cool mornings, dry and warm days and cool evenings. Fully air-conditioned buildings, a swimming pool and jacuzzi. Enjoy amazing evenings swimming under the moon. Use the player below or click here to listen to the free recording. Learn Focusing, really learn it, so it's an easy, trusted part of your life; feel comfortable and solid being a Focusing partner to another person; experience the subtle and intricate "felt sense" and how life flows forward from there. *Note: This course meets the qualifications for 16.5 hours of continuing education credit for LMFTs, LCSWs, LPCCs, and/or LEPs as required by the California Board of Behavioral Sciences. PCE#62524. Discover and practice how Focusing partnership deepens your experience of being present to yourself and another person. This training by one of the most experienced Focusing teachers in the world takes you step by step, gaining skills and feeling confident in your ability to do Focusing by yourself and with a Focusing partner. By the end of the week you'll be ready to carry Focusing forward into your own life setting. Ann loves to create comfort and safety in a group as well as a sense of fun and community. Ann Weiser Cornell is internationally recognized as one of the leading innovators and theoreticians of Focusing. She is the author of The Power of Focusing: A Practical Guide to Emotional Self-Healing, Presence: A Guide to Transforming Your Most Challenging Emotions, and Focusing in Clinical Practice: The Essence of Change. She has taught Focusing in 20 countries around the world since 1980, and has developed (with Barbara McGavin) a system and technique called Inner Relationship Focusing. She has given presentations and trainings in Inner Relationship Focusing at the Esalen Institute, the Psychotherapy Networker Conference, the National Institute for the Clinical Application of Behavioral Medicine, the American Psychological Association, and the Cape Cod Institute, as well as offering over 75 privately organized workshops and phone seminars every year. She is a close colleague of Eugene Gendlin, and has co-taught fifteen courses with him on various aspects of Focusing, philosophy, and psychotherapy. Pausing can also transform social contexts, all the way to the possibility of social transformation. Cultivating our ability to pause helps us connect naturally with our felt sense, opening up new possibilities for a more authentic living, where compassion, affection and love may arise in a natural manner. Pause can help us cultivate a natural way of attending, sensing, listening, accompanying and living authentically in our significant relationships. During our time together we will explore the essence of the natural pause, and its impact on personal and community wellbeing. We will have the opportunity to experiment with our natural pause and attend to the intricacy that emerges from this simple practice. Being together and in nature will allow us to consider different ways that we can walk and 'live' the path of the pause with grace and authenticity... bringing the possibility for transformation and peace inside and around us... one pause at a time. William Hernández & Soti Grafanaki, Ph.D are certifying Coordinators of Focusing. William is the Executive Director of a nonprofit social development organization, whose mission is to improve, in a sustainable manner, the living conditions of the most vulnerable groups in Ecuador. William has worked from 2010-2014 in the development of the Felt Sense Literacy project with Gene Gendlin and Mary Hendricks. In the Social Development field he has created and implemented the model: “Human Development through the Pause,” which has significantly contributed to empowering people and reducing community tensions and family violence. Since 2009, Pause Workshops have been offered to 6,700 leaders from more than 230 organizations and rural communities in Ecuador. Soti joined William in 2012, in his effort for a Pause Movement as a possibility for peaceful living and sustainable human development around the world. Soti is a Professor at the Graduate program of Counselling, Psychotherapy and Spirituality at Saint Paul University in Ottawa, Canada. Soti has published in the areas of facilitative conditions, flow and optimal experience, congruence, and therapist development. William and Soti have offered many workshops in Europe, North & South America, and have developed practical resources for supporting and spreading the Pause Movement. And that is just the beginning! Using TAE, you can bring something new for yourself and communicate it to others. In a step-by-step process you will learn how to say more and put your own original ideas into the world with clarity, confidence and success. The skills from this workshop can be used in many different areas of life: personal development, business meetings, professional proposals, creative writing, family interaction, public speaking, educational events, negotiation skills, mediation, and in endless other ways. Nada Lou is well known throughout the Focusing world through her double specialty in teaching Focusing and Thinking at the Edge (TAE). She co-presented TAE workshops with Dr. Gendlin and is in the forefront of spreading this practice around the world. Nada is a Focusing Institute Coordinator certified to train those wishing to teach Focusing/TAE. Writing The Grassroots Introduction Manual to TAE and immersing herself in Gendlin's thinking through her DVD Productions has made Nada one of the world's experts in TAE. Nada has the ability to gently and patiently nurture each person's thinking edge, guiding them at every step. In this major, we will begin with a beginner's mind of Focusing...as there is always something new and fresh, whether you are a beginner, advanced Focuser or in-between. We will warm-up to various creative modalities-art, movement, writing, plus some music-to re-discover how the arts were our first expression and connects us to our aliveness, authenticity, creative spirit, each other and the world. As the week unfolds, we will explore further interconnections between Focusing and the expressive arts including: 1) Reducing stress and accessing a place of inner wholeness; 2) Focusing on a peaceful place or source of strength, interweaving the arts; 3) Bringing Focusing and the expressive arts to a life issue and experience the unfolding of deep wisdom; and 4) Your own self-care and other applications. Laury Rappaport, Ph.D., MFT is the pioneer of Focusing-oriented expressive arts (FOAT®) and the Founder/Director of the Focusing and Expressive Arts Institute. She is a Certifying Coordinator and Trainer with the Focusing Institute and has taught Focusing, the expressive arts, and psychotherapy for over 35 years including Lesley University, Notre Dame de Namur University, Sonoma State University, the University of Hong Kong, as well as in Japan and Israel. Laury is the author of Focusing-Oriented Art Therapy: Accessing the Body's Wisdom and Creative Intelligence, editor/author of Mindfulness and the Arts Therapies, and numerous chapters and articles. Currently, Laury is an Integrative Psychotherapist at Sutter Health, Institute for Health & Healing. It is an organic exchange in which Focusing skills and attitudes are key. We'll work with our body, movement, symbols, art materials and experiential process. We'll connect with and express our playfulness, creativity and inventiveness, while including (not pushing away) the shy (non-verbal) elements of ourselves that are not ready to show their playful faces yet. You'll learn how to transfer these experiences into your own life as a (grand) parent, as a teacher or as a therapist. This is intended to be helpful for therapists, teachers, (grand) parents or anyone who works or plays with children. It is also simply for ourselves, to be in contact with our own creativity, playfulness and with our own inner child. René Veugelers: As a Coordinator specialising in Children's Focusing, with an emphasis on the non-verbal world, René teaches parents, therapists, teachers and others how to be with children in a Focusing way, how to (re)connect to their own inner child experiences and how to integrate creativity and flexibility into their life and work. His experiences as an art therapist embrace an expanded richness of creative elements and support a natural unfolding of creative process. René lives and works in the Netherlands and teaches internationally. He is an inspiring teacher who brings considerable experience, subtlety and joy to every person attending his workshops or training. We are delighted to have Rev. Peter Campbell, co-founder of the Institute for Bio-Spiritual Research joining us for the week. One evening Peter will speak on the topic, "What is the Body's Role in Spiritual Development?" Peter Campbell: Rev. Peter Campbell, Ph.D. holds a doctoral degree from the University of Ottawa in Canada, with a specialization in the psychological study of religion. Together with a colleague, Rev. Edwin McMahon, Ph.D, the two Catholic priests have concentrated their attention on developing a more effective inner body-learning process called, BioSpiritual Focusing (BSF), within which those who share a common faith or interfaith can best learn a new habit for noticing and nurturing their important feelings. The priority here is no longer simply one of acquiring new information in the mind, but including how our own bodies and feelings know and express spirituality within religion within the body’s knowing and not only through the mind thinking. Each morning before breakfast, Jillian Woodford will offer a yoga class, inviting you to spend a little time dropping out of your mind and into your body, connecting with your innermost experience. She invites you on a journey through the ever-changing flow of sensations that arise out of breathing, stretching, moving, and being still. Guiding attention away from mind and into this flow, you can find a deep rest and stillness. Everyone is welcome. Jillian Woodford began her yoga journey over 30 years ago when she discovered the teachings of Raja Yoga in India. She then gravitated into Hatha Yoga in the UK where she trained in the Iyengar style. Some years later she studied Ananda and Sivananda styles as well as Yoga Nidra in California, and Nadha Yoga in France. She also trained in therapeutic and restorative practices. She has offered general yoga classes for the past 20 years in the UK, USA, and UAE. Her favorite masters and teachers come mostly from the lineage of Sri Ramana Maharshi, advaita, and western non-duality. Today, she experiences yoga as a way to promote presence – a practice not to get somewhere else, but to be where and as we actually are in this very moment, with this very breath, whether the experience is pleasant, unpleasant, or neutral. In the afternoon time before dinner, Marieke Hoeve will offer Playful Movement through Pulsing. Pulsing is a very soft, playful way of movement-based bodywork that helps you move more freely and feel more alive. Pulsing is based on natural and subtle movements, and is deeply relaxing and a wonderful supplement to Focusing. We will do the work in pairs, giving and receiving the pulses, either standing, or lying down on mats. Come and try it! Why did you come to the Summer School? ...I wanted to refresh my understanding of Focusing and deepen my body awareness. ...I wanted to get a sense of what the field is all about and to learn to how to Focus by myself and with others. ...I have a desire to know myself and get in touch with my feelings….to get out of my head. What was the best thing about the Summer School? ...I learned so much and met so many others wanting to find their “true” selves. ...Interacting with so many like-minded people from a variety of countries and professions. These 90-minute afternoon workshops give you a chance to experience the rest of the teachers’ work through a variety of fascinating topics and processes. They do not need to be registered for in advance. The felt sense and the creative expression through the arts provide a way for us to connect beyond verbal language and culture with ourselves and each other. Your dream knows a lot more about you than you do! Dreams are fascinating. Your body can open up to your inner knowing spontaneously in the dream, because it can bypass the usual daily intrusion. Dreams bring you something that Focusing doesn’t access as easily. In this workshop we will explore your dreams and interpret them in a felt sensing way. Once you learn how to hold the dream in a Focusing way, and let the felt sense, not the content of the dream, connect to your situation, the felt sense will give you support, interpretation and the next step for carrying forward your situation. From Nada’s extensive video library from following Gene Gendlin as his main videographer she will choose representative clips so you can encounter him. You will hear him talk about his Philosophy, about Focusing, and about Thinking at the Edge. But mostly you will meet this gentle genius in his human and often humor-filled presence. Being with children or teenagers in a Focusing way is about contacting the vitality and life energy in each one of us. And working with your whole body. I will invite you to explore new ways of making connection with yourself, with your whole body and how you can make a real congruent connection with a child. We will practice skills like: attuning, moving together, noticing each other's rhythm, finding a gentle way to pause and create safety for a next step. For parents who want to be with their children in a different way, for therapists and teachers who want to explore non-verbal expression and for Focusers who want to invite their creativity in a surprising and fresh way. You will learn Gendlin's key concepts for how to integrate Focusing into psychotherapy, and have an opportunity to bring questions and talk about your clients, as well as ways that you have found to carry Focusing forward in your work with different populations, clinical issues, self-care, supervision and/or personal growth. Can it be challenging to find words to fit your felt senses? Wouldn’t it be a relief to invite your body to express itself in images and symbols, instead of words? Creating a personal collage can be an immediate and fun way to connect deeply with ourselves while keeping a playful distance from any residualheaviness we may still be carrying. You will be invited to be curious, colorful and surprised in this non-verbal attunement to creative expression. This exploration will bring fresh knowledge to support your natural Focusing process. Do you live surrounded by too much stuff? Are there too many papers, too many projects, too many emails? The things we live with reflect our selves back to us: our history, our values, even our identity. And our lists of undone projects, as well as our over-full closets, call out to us to pay attention to them in a fresh way. Join Ann for an enlivening shame-free workshop on how to hold on and how to let go. In my daily work with children, I have discovered that you need to listen in three directions: to your own inner process, to the verbal and non-verbal exchange and to the inner world of the child. Are you able to step into a child's unknown world and let whatever emerges guide the next steps you take together? In this presentation I will show a video of a Focusing session with 11-year-old Rex. You will see me using Focusing, art materials, and experiential process to attune to and empathize with his story and deeper needs. You will discover what can be supportive when a process is blocked. The aim of this ‘pause workshop’ is to support you to connect with your own natural pause and discover ways to apply it in your everyday life. Through simple experiential exercises participants will notice the difference between pausing and not pausing and the impact of the pause in sensing deeper our bodies and listening more authentically and compassionately to each other. Mindfulness, Focusing and the expressive arts are all tools for presence, awareness and inner contemplation. Each offers something unique. In this workshop, we will spend some time practicing mindfulness, followed by Focusing, noticing a felt sense and allowing it to naturally unfold into creative expression. There will be time for sharing about the experience. With the natural environment as our backdrop, we will explore ways to connect with our own natural pause. This experiential workshop will support paying deeper attention and connecting through the pause with elements from our inner and external natural environment and sensing freshly what is present. Do you ever sound like this? In the tough times of our lives, we often find phrases like “not good enough” or “I’ll never be able to…” swirling in our heads. These seeming self-attacks just make bad feel worse, don’t they? Ann has done many years of research and work with what’s called the “inner critic,” and has made three important discoveries that completely reverse the usual view on this painful experience. In this experiential workshop you’ll put these three insights into practice with your own critical parts, and end up well on the way to turning the inner critic into a friend. The workshop will present a new social development model that places Literacy of the Pause as the cornerstone of sustainable human development. We will review the key processes and practices from the successful implementation of this new model and the potential for worldwide dissemination and application in many diverse contexts. Empirical data will highlight the role of the pause as the fastest and most direct pathway to promote Felt Sense Literacy and improve the life conditions of vulnerable and marginalized groups. An introduction to some of the main ways that Focusing is presented, and what they all have in common… in other words: What is the essence of Focusing? Includes an exploration of Focusing terminology such as “felt sense” and “carrying forward.” Followed by an introduction to the work of the Focusing Institute. Let’s help you imagine what it will be like to be at FISS! FISS is a wonderful time for you: whether you are needing time for rejuvenation, time for a retreat from the busy-ness or daily routine, time for self-inquiry, personal or spiritual growth, or connection with a kind-hearted community where you can deepen into Focusing. This year's FISS offers a special feature as it takes place at Joshua Tree in southern California. One of our FISS teachers, Laury Rappaport, has spent time there and shares, "It is a most magical, wonder-filled place. The trees are so unusual and the huge rounded rock formations suggest many imaginative sculptures in nature.” And the National Park Service reports, "Joshua Tree provides space for self-discovery, and can be a refuge for the human spirit." Each morning starts with an optional yoga group in a beautiful room. If you like to start your day with yoga, this will be perfect! Then after breakfast the whole group gathers as a community for half an hour. There will be an “attunement” (a guided Focusing experience) by one of the teachers, and then announcements and explanations of what is happening that day and what to prepare for. Every morning from 9:30 AM to 12:30 PM you go to the class that you chose at the start of the week. It’s your chance to have an in-depth experiential learning process with one of our fabulous teachers (or teaching team). Each day the learning builds and so does the sense of bonding and trust in the group you are in. After lunch, there is free time for taking a walk, a swim, a nap, visiting the Focusing Institute bookstore, whatever you like. There will also be a a meet-up place for those who want to use this after lunch time for Focusing partnership (exchanging Focusing sessions). More movement! After the workshops and before dinner, we will have an optional movement/bodywork group by somebody great. After dinner, 7:30 – 9:00 PM, there will be some interesting presentation every night except one. We give one free evening so everyone can relax! And after that? Each evening for night owls we will offer optional games, dancing, singing, etc. Retreat Photographer: $75 off current tuition plus $50 credit at our onsite bookstore – must have own digital camera. Retreat Videographer -- $150 off current tuition plus $50 credit at our onsite bookstore – must have own video camera. Audio/Visual -- responsible for all audio/visual needs throughout the week. Equipment is provided. $450 off current tuition plus $50 credit at our onsite bookstore. Catch-all (room set-up and clean-up, helping with general requests) -- $350 off current tuition plus $50 credit at our onsite bookstore. Translators (if needed) when 4 or more people register who need translation, we seek translators – please submit your application early if you are interested so that we can contact non-English groups to let them know the opportunity exists – full tuition paid. If you have questions about the work study jobs listed above, please contact Elizabeth at 845-480-5111 or elizabeth@focusing.org before applying. Please Note: Work Study applicants are responsible for Room & Board fees – discount listed applies ONLY to tuition. To apply for Work Study Jobs: please submit by email a brief statement of your applicable experience to workstudy@focusing.org and include Workstudy + the position title in your subject line. Applications will be reviewed in the order they are received. As Work Study jobs are filled, we will update the list as quickly as possible. An application does not guarantee the position. You may apply for more than one Work Study job. August 21, 2016 (Sunday) – August 27, 2016 (Saturday). Program begins with dinner on Sunday and ends with lunch on Saturday. The beautiful Joshua Tree Retreat Center in Joshua Tree, California. The Joshua Tree Retreat Center (designed by Frank Lloyd Wright) is located in the California hi-desert which means cool mornings and evenings. Mid-day warmth but fully air-conditioned in buildings. Swimming pool and jacuzzi. Shaded areas are great - outdoors fine as long as in shade during the mid-day. Cools off late afternoon for amazing evenings and swimming under the moon. Prices include room, board and facility use. Changes to your room reservation: Room type (single or double) changes are permitted (space permitting) until Aug 7, 2016. A $25 processing fee will be charged in addition to the adjusted amount. Any changes to your room and board choice should be emailed to rita@focusing.org. Register Together: When two people register together, each person's tuition fee is reduced by $50 (combined savings of $100). If you are registering together with a friend, please give the friend's name, address, phone number, email and morning course choice in the special instructions box on the last order page or call in your registration: 845-480-5111. Membership: Focusing Institute Members who have paid their 2016 dues get $50 off the tuition price. If your 2016 dues are unpaid, they will be charged when the order is processed. Joshua Tree Retreat Center is located approximately 45 minutes from Palm Springs International Airport, 2 hours from Ontario (CA) Airport, and 2 1/2 hours from Los Angeles International Airport and John Wayne (Orange County) International Airport. Shuttles from Palm Springs International Airport cost approximately $35 per person each way for groups of 3 or more and approximately $85 for a single rider or 2 people per car. Some travel and transportation information is provided here. Please check directly with each company. The Focusing Institute may arrange for shuttle vans to and from Palm Springs Airport if needed–registrants will be contacted in April or May regarding this option. All workshops will be taught in English. We will make every effort to arrange for translation when 4 or more people from a single language group register and indicate a desire for translation. Please inform us as early as possible if you believe you will want or need translation. Three meals will be served per day buffet style and will include meals from a variety of cuisines. Most dinners will include a meat or fish option. Vegetarian, vegan and gluten free diets will be accommodated. The online registration form will include these choices. We are pleased to be able to offer payments plans if needed. Please call Elizabeth at 845-480-5111 to discuss an option that will work for you. $150 administrative fee for cancellation. After June 21 all fees are nonrefundable except in unavoidable emergency. The Focusing Institute reserves the right to cancel or re-schedule for insufficient enrollment or for other unanticipated reasons. In such cases you will be given a choice of applying your tuition to future programs, or the full enrollment fee will be returned. If you are registering together with a friend, please give the friend's name, address, phone number and e-mail in the special instructions box on the last order page. If you choose the membership discount and your 2016 dues are unpaid, you will be charged now. Registration now closed. Please call 845-480-5111 to inquire about a late registration. -- Choose How did you hear about this? -- An email announcement A friend told me about it I found it myself on your website Facebook or other social media Other - please specify in the special instructions box on the last shop page.